The development of the Radio was the culmination of a long process bringing together the fundamentals of theoretical physics and the experiments of a few, exceptional, engineers. ... but some researchers were already experimenting with magnetism. The first machines were developed to carry out experiments based on static electricity, allowing the experimenters to become familiar with new and spectacular phenomena, such as disruptive discharges, 'electric wind' and the ionisation of gas, by flame. The English doctor, William GILBERT (1544-1603), Royal Physician to Queen Elizabeth I and to James I, was the first to propose the idea that the earth is an enormous magnet, and that all matter is either isolating ('nonelectrics') or conducting (electrics). He described his research in his book "De Magnete" (Of Magnets) the title itself demonstrating that we are at the still at the earliest point in the development of the 'exact' sciences. In the world of light and opticks the theory that light consists of particles, based on former views, could not explain phenomena such as diffraction and polarisation. The work of Isaac NEWTON (1642-1727) and in particular, his analyses of the decomposition of white light by a prism, contributed to the evolution of knowledge and signalled the decline of the particle theories. It would take a further fifty years before the French scientists, trapped in Cartesian dogma, acknowledged the idea of the interaction of bodies and contributed to the development of this new theory. Of course, Radio is not yet born, but the idea that physical action can exist across a space, devoid of all matter, is a revolutionary leap forward. It is only right to note the remarkable contributions of numerous scientists to the adoption of these new ideas, and in particular LAGRANGE who brought together in his Maison d'Arcueil the cream of physicists of the time to discuss the basic fundamentals of modern physics and mathematics. In this melting pot of new ideas, the wise and famous rubbed shoulders with each other, people such as GAY-LUSSAC, HUMBOLT, BERTHOLLET student of Lavoisier, Jean-Baptiste BIOT, Etienne Louis MALUS were among other multi-talented, multi-disciplined chemists, physicists, astronomers and mathematicians. At the end of the 18th century, revolution was not only to be found in the streets, it was in the heads as well! The idea of the need for scientific collaboration was also born. The Arcueil Society (La Société d'Arcueil) was the first to demonstrate that experimental science need no longer be a solitary science. (Les Cahiers de Science &Vie - November 2001). In 1690, Christiaan HUYGENS (1629-1695) Dutch physicist, mathematician and astronomer, was without doubt, one of the first to put forward the theory of light waves in his traité de la lumière. Charles COULOMB (1736-1806) on the eve of the French revolution, wrote seven memoirs in which he established the experimental and theoretical bases of magnetism and static electricity. Another noteworthy contributor is the British chemist and physicist Henry CAVENDISH (1731-1810) who, among other successes, established a means of measuring the strength of static electricity. Around 1750, the English physicist John CANTON studied electro-static induction. His conclusions brought into question the electrical theories of the time (models based on one or two fluids) which required the transfer of electrical fluids. The possibility of the existence of physical phenomenon between two bodies without direct contact, grows in acceptance. Augustin FRESNEL (1788-1827) demonstrated that Newton's theory of particle emission could not account for numerous phenomena. His research with Louis ARAGO (1786-1853) and Leon FOUCAULT (1819-1868) led to the establishment of the light wave theory (in 1820) which applied later to other electromagnetic fields. Joseph FOURIER (1768-1830) father of mathematical physics, developed new mathematical tools (number series and the Fourier Transform) which would help the new physicists understand and describe the phenomena they were observing. Scientific discoveries accelerated from the start of the 19th century. Alessandro VOLTA (1745-1827) having understood the importance of the works of Luigi GALVANI (1737-1798) invented, in 1800, the battery. The Danish physicist, Christian OERSTED (1777-1851) during a long series of experiments carried out between 1807 and 1820, demonstrated that a magnetised needle placed near to an electric conductor will move in a direction dependent on the direction of the flow of the electric current. His work was quickly recognised by those at the forefront of science at the time, particularly the French, and ARAGO, in 1820 achieved the magnetisation of iron by use of an electric current. .... and the starting point for the invention of Radio. Jean-Baptiste BIOT (1774-1862) and Felix SAVART (1791-1841) French physicists, established in 1820, a means to measure the strength of a magnetic field created by an electric current, thus creating the BIOT-SAVART Law. In Germany, Johann SCHWEIGGER (1779-1857) built a multiplier which was, in fact, the first galvanometer. For his part, in France, Claude POUILLET (1790-1868) invented the "tangent compass". Pouillet supported the work of OHM and confirmed OHM's Law in 1834. At the same time, the French physicist, André-Marie AMPERE (1775-1836) developed the theory of electromagnetism. Taking the galvanometer, he invented, with ARAGO the electro-magnet, the foundation of the electric telegraph. He also invented the name solenoid to describe the bobbin used (from the Greek soleinedes meaning pipe-shaped). The electro-magnet was refined in England by William STURGEON in 1821. In 1831, an Englishman, Michael FARADAY (1791-1867) proposed the hypothesis of the existence of electric, magnetic and gravitational fields between disparate objects. He described electromagnetic induction which allows the conversion of magnetism into electricity. He invented the first electric motor. At the same time, he investigated electrical discharges in rarefied gases and produced evidence of the phenomenon of ionisation. The American physicist, Joseph HENRY (1797-1878) perfected the electromagnet and constructed a mile long telegraph line in 1831. Following his work on the telegraph, he discovered, in 1832, self-inductance. He observed the effects of induction caused by the electrical impulses during lightning strikes. He managed to magnetise a steel needle placed 10 metres from his spark generator. Heinrich Daniel RUHMKORFF (1809-1877) German mechanic and electrician, invented the induction coil which bears his name. Heinrich LENZ (1804-1865) a Russian physicist of German origin, published, in 1833, the law describing how induced voltage causes current to flow around a loop (Lenz' Law). A major step towards the Wireless, has been made. In 1832 in the United States, Samuel MORSE (1791-1872) invented the telegraph and the famous "Morse Code" which would also help to achieve the first radio transmissions. In 1855, the British inventor David E. HUGHES (1831-1900) added a magnetically operated stylus with which the signals were recorded on a roll of paper tape, making the machine much more functional. One of the first steps towards the Wireless is without doubt, the demonstration of the potential use of an earth return for the telegraph. Following the work of Carl August von STEINHEIL (1801-1870) a German physicist who built the first public telegraph between Nuremberg et Fürth around 1838, the possibility of a telegraph link using a single cable over long distances was confirmed and from 1842, MORSE installed the first single cable lines in the United States. The phenomenon of electrical induction continued to fascinate numerous researchers, doctors and scientists. In 1854, James Bowman LINDSAY (1799-1862) a Scottish electrician, patented a wireless telegraphy system using water as a conductor. The development of more and more powerful RUHMKORFF coils, allowed researchers to push their experiments further and further, often in physics laboratories bearing RUHMKORFF's name where the coil had become an indispensible piece of equipment. Such experimental laboratories were built in Europe and the United States. In 1858 Wilhelm FEDDERSEN (1832-1918) German physics professor at LEIPZIG demonstrated experimentally that the sparks jumping between the spheres of a RUHMKORFF coil oscillated and that they could generate electric waves of long wavelength. In 1861, he used the rotating mirror designed by British physicist Charles WHEATSTONE (1802-1875) to record the phenomenon on a photographic plate. The propogation of these waves, as with light waves, happens in all directions. The figure opposite, shows the pattern of these oscillations. Their short lifespan fascinated Helmholtz. The influence of his observation was very limited at the time. In 1864, James MAXWELL (1831-1879) inspired by the works of FARADAY, united electric and magnetic phenomena in his famous electromagnetic theory of light. MAXWELL's theory was used by HERTZ (1857-1894) to discover the waves that now bear his name. MAXWELL's theory is complex and its mathematical presentation difficult to understand. It would probably not have been so readily accepted by the scientific community of the time, had it not been for the support of certain enlightened physicists. Among MAXWELL's most fervent supporters, we should mention George Francis FITZGERALD (1851-1901) Professor at Trinity College, Dublin, who, through his Presidential Address to the Mathematical and Physical Section of the British Association for the Advancement of Science in 1886 made, without doubt, a major contribution to the recognition of the works of MAXWELL and HERTZ and later, researchers like Oliver LODGE. In 1882, FITZGERALD, in his paper to the Royal Dublin Society, On the Possibility of Originating Wave Disturbances in the Ether by Means of Electrical Forces, presented the idea that it only needed the construction of an electromagnetic wave generator of sufficient power to convince the entire scientific community of the revolutionary character of MAXWELL's theory. In 1866, the American Mahlon LOOMIS (1826-1886) experimented with a system for transmitting electrical signals in the atmosphere between two kites covered with copper wire screens, linked to a galvanometer and 18 miles apart. The Wireless is almost reality! Nevertheless, we have to wait for the work of Dutch physicist LORENZ (1853-1928) Nobel Prize winner in 1902 with Pieter ZEEMAN, to amalgamate these discoveries and present a theory based on the existence of electrons. LORENZ' microscopic theory of matter which links up with the macroscopic MAXWELL theory, explains a great number of phenomena such as the electrical conduction of metals, chromatic dispersion of light, or the influence of magnetic fields on the dispersion of rays and even gives a new vision of 'ether'. Progressively, man passes from the mechanical view of his environment to an electronic view of matter in which mass and time are nothing but the displacement of quantum energy. EINSTEIN arrives on the scene with his Theory of Relativity (1905) which throws scientific understanding into disarray and gives birth to modern physics. But, the theories would be worthless without the ingenuity of the inventors and researchers. Thomas Alva EDISON (1847-1931) American inventor, perfects the incandescent light (1878) and recognises thermo-electron emissions (1881). In 1878 David Edward HUGHES invented the microphone. Some years later, in 1888, Nikola TESLA conceived the first operational system for the generation and distribution of alternating current for the electricity networks (grids). From 1890 Edouard BRANLY (1844-1940) professor at the Institut Catholique de Paris investigated the experiments of Hertz. IN 1890, he perfected the "tube radioconducteur" used as a receiver for a Hertz oscillator. The photo opposite shows the first "receiver" developed by Branly. The "radioconducteur" is on the left of the image. It is connected, in series to a battery and a galvanometer. At rest, the needle is at zero. Under the effect of an electromagnetic disturbance (spark) the needle moves. Tapping the "radioconducteur" resets the galvanometer to zero. In Italy, Augusto RIGHI, physics professor in Bologna, was also investigating electromagnetic waves and repeated Hertz' experiments using a modified oscillator. In Britain, Sir Oliver LODGE (1851-1940) a professor at the University of Liverpool, took up, in 1894, the work carried out by Hertz and Branly. He perfected Branly's radio wave detector, adding to it a mechanical shock device to bring the detector back to its resting state. He called the device a "coherer". In 1894, LODGE demonstrated, for educational purposes, the transmission and detection of radio waves over a distance of approximately 30 metres. He didn't recognise the significance of his achievement, but from this point, things would advance very rapidly. The same year, Eugene TURPAIN (1848-1927) a French chemist, carried out, in BORDEAUX, the first radio telegraphy experiment, transmitting a message by radio waves. The Russian, Alexandre Stepanovitch POPOV (1858-1905) a professor of civil engineering, built, in 1895, a device designed to measure electrical disturbance in the atmosphere. He was the first to perfect transmission and reception devices and invented the aerial . Eugene DUCRETET (1844-1915) manufacturer of scientific precision instruments, then radios, then X-ray machines, also built machines (1887) to reproduce the experiments carried out by Hertz. He worked with POPOV and on the 5th November 1898 carried out a test Morse transmission between the Pantheon and the EIFFEL tower. The transmitter was positioned on the tower, operated by another, principal, collaborator, engineer Ernest ROGER. Jules CARPENTIER (1851-1921) former engineer with the French railway company PLM, after taking over from RUHMKORFF, manufactured the first Branly radio wave detector tubes in 1900. In Italy, Guglielmo MARCONI (1874-1937) a student of RIGHI, was pursuing his passion for electricity and electromagnetism. In France, engineer Gustave FERRIE (1868-1932) was developing the interest he had had in wireless since 1898. In 1904 John FLEMING (1849-1945) connected an oscillating circuit to the plate of an EDISON tube. He noted that the galvanometer, connection in series, registered a deviation during a radio transmission. He patented his Oscillation Valve system in November 1904. He had the valves manufactured and they were baptised "diodes" by Dr W.H. ECCLES. FLEMING did not invent the diode, EDISON takes the credit for that, he simply introduced a plate into the tube and applied the EDISON effect to create a rectifier and detector. The studies of DRUDE, SLABY and WIEN led, in 1905, to an improved understanding of the behaviour of radio waves. Lee DE FOREST (1873-1961) working since 1903 on detectors, decided, in 1907, to introduce a polarising battery, in the anodic circuit of a FLEMING valve. This modification made the valve much more sensitive. On the 15th January 1907, DE FOREST applied for a patent on the new tube which he called "AUDION"..
On the 29th January, he applied for a further patent regarding the introduction of a third electrode, placed between the filament and the anode. This semi-opaque electrode, was called a grid because of its interwoven structure, and to distinguish it from the plate which was formed from solid material. Lee de FOREST also had the idea to link this electrode to a circuit connected to an aerial. The signal heard in the headset placed in the anode circuit was stronger than that heard with a simple diode. He had invented the first electronic amplifier. Reginald FESSENDEN (1866-1932) a Canadian and former collaborator of EDISON, had the idea of overlaying two high frequency radio waves to carry low frequency audible waves - speech. He also invented a detector sensitive enough to be used in radio telephony. In 1906 he built a powerful transmitter in Massachusetts. The industrial production of the triode in Europe and the US was quickly established. The production of these first valves was made strategically important with the declaration of the First World War. The first valves produced were reserved exclusively for military use. At the end of the war, it was the OSRAM company which produced, in association with MARCONI, the triode shown opposite, one of the first commercial models available for public use in England. In 1908, the workshops of Carpentier, Gaiffe and Rochefort formed the Compagnie Générale de Radiotélégraphie (C.G.R.) of which Professor d’ARSONVAL became president. The Minister for War, ordered three transmission stations; Belfort, Toul and Verdun, from C.G.R. Emile GIRARDEAU (1882-1970) engineer, on the 3rd April 1910 formed the Société Française Radioélectrique with BRANLY as Technical Director, to build wireless equipment. The leading French manufacturer in 1920, he created a subsidiary company to exploit the transmitters of Saint Assise, known as "RADIO FRANCE". Valdemar POULSEN (1869-1942) built continuous wave transmitters using arc transmitters according to the principles proposed by William DUDDELL . From 1912 a regular wireless service was operational between San Francisco and Hawaii. In 1914, the Germans installed a military radio station at Kamina in Tongo. Research now turned to the elimination of arcs and their harmonics by use of ALTERNATORS. The first of these machines turned at 3000rpm. Power output was in the range of 250 to 500 kW. A frequency of 15000Hz to 20000Hz corresponding to wavelengths of 20000 to 15000 metres. To reduce the wavelength, it was necessary to develop frequency doublers, triplers and even quadruplers which still generate wavelengths of the order of 3500 to 5000m. FESSENDEN had the idea of mixing a low frequency signal with a high frequency carrier wave. He called this the HETERODYNE system. At the same time, it was discovered that a coil, inserted in series in the plate of the triode and coupled to a coil in the grid circuit, could, under certain conditions, generate an auto-oscillation which in turn generated radio waves. This configuration opened up numerous possibilities in the field of transmission. The triode was used in all the fundamental radio functions, low frequency amplification, high frequency detection and as an oscillator. Industrial developers desparately sought improvements in selectivity and sensitivity of their receivers and proposed more and more elaborate models. The early propositions had, nevertheless, the inconvenience of having as many tunable circuits (variable condensors and induction coils) as amplifiers, that there were often several knobs to be turned to change station. And, the increase in amplification created instability in the receivers which were subject to sticking (auto-oscillation) making their use even more delicate and their functioning haphazard. This problem would be solved by improvements in the characteristics of the components and by the implementation of NEUTRODYNE circuits. In 1914, the Austrian engineer, Alexsander MEISSNER (1883-1958) developed the principle of a "super heterodyne" assembly. In 1917 in France, Lucien LEVY created and perfected the "SUPERHETERODYNE" assembly, still in use today. He deposited 2 patents, one the 4th July 1917, the other the 1st October 1918. Still in 1917, thanks to American engineer Edwin Howard Armstrong, we see the development of the triode, turning it into an autodyne receiver, reactive receiver and a transmitter . At the end of the First World War, in 1918, construction of the first continuous wave transmitters, using triodes, started. The early spark transmitters, based on Marconi principles, and which transmitted coded information (time and weather information) directed towards navigatory and military applications, were still in use at the time, but, their days were numbered. They were rapidly overthrown by continuous wave transmitters capable of transmitting music and the human voice. Between 1916 and 1919, the wireless became the RADIO with the introduction of valves. It was the end of the electric period and the start of the electronic age. With the end of hostilities, the political powers in France, and elsewhere, pushed by industrialists, were quick to understand the benefits of developing public radio broadcasting. In the United States and in Canada the first commercial Radio stations were born, trasnsmissions were planned and organised - programmed. On the 26th November, 1921, the first French public radio broadcast was made. In the premises of the new and powerful radio station of SAINTE-ASSISE, near Melun, an opera singer, mademoiselle Yvonne Brothier, stood, surrounded by technical transmission equipment, and sang "la Marseillaise", la "Valse de Mireille" and an extract from "The Barber of Seville". Forty kilometers away, members of the Société Amicale des Ingénieurs Electriciens, gathered together for a banquet at the Hotel Lutetia in Paris, heard the singer's voice with "a great intensity and perfect clarity." Enthusiasm was not in short supply. The concert was heard on numerous radios, both French and foreign, within a radius of 1600 kilometers. The number of listeners was still very low, radio reception being limited to members of a "switched on" public. In February 1922, Emile GIRARDEAU returning from the USA, proposed the creation of a public service, broadcasting news and music. French Radio is born ! On the 14th November 1922, in England, the BBC started broadcasting. Starting in PARIS, then spreading to the larger cities throughout France, fans of classical music and operetta could listen to their favourite works in their own homes. Staring in this year, 1922, the SFR station in Levallois-Perret (2kW output) gave daily concerts on 1525m between 8:45 and 10:00 in the evening, as well as a concert every Sunday at 2pm. The LYON-La DOUA station broadcast every morning at around 10:30, on a frequency of 1600m, a radio message which started, "This is the Radiotelegraphy station of the LYON Post and Telegraph Administration." Radio culture, reserved up until now for a minority of intellectuals, would finally break into the homes of the more humble listener. In France, almost everyone knows the tune, from the operetta, "LE PAYS DU SOURIRE" called "Je t'ai donné mon coeur" sung by Rudy Hirigoyen. A tune which excited the hearts of many French people early in the 20th century. Click on the phonograph to hear an extract of this song. The first speaking newspapers appeared, as well as the laws on the right to install a radio transmitter. It must be remembered that this was still very soon after the First World War and that the politicians clearly understood the strategic implications of Wireless. 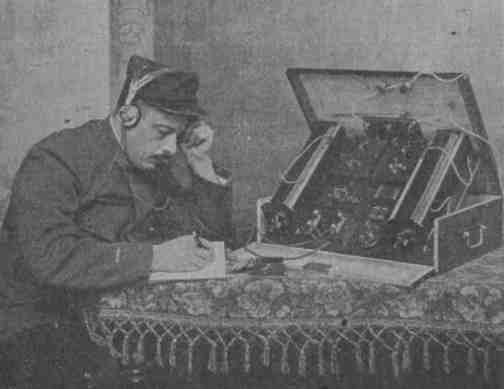 Marcel PELLENC (1897-1972) Director of the "Ecole superieure des PTT", (the training college for the French Postal administration) brought into operation, on the 19th January 1923, within the college, 103 rue de Grenelle, PARIS, the first medium wave radio in Europe. Rene MESNY (1874-1949), who, during the 1920s had joined the team of General FERRIE, established, with the help of Georges BEAUVAIS, a VHF radio link between mainland France and Corsica in 1926. The management of the airwaves (the right to broadcast and the allocation of frequency ranges to different users) became an international preoccupation which led to the creation of the International Telecommunication Union (ITU) whose role was, and remains, to produce new legislation and coordinate the necessary management organisations. The first long distance radio transmission experiments over short wave or ultra-short waves brought out the phenomena of signal propagation in space and the possibility of using line of sight broadcasting, or bouncing signals off the upper atmospheric layers, depending on the wavelength used. The first reviews popularising the new techniques also appeared and were devoured by a hungry public. A public, still bearing the scars of war, enthusiastically welcomed the efforts of radio pioneers like Joseph ROUSSEL who, in France, threw himself into a public awareness campaign, organising radio clubs, conferences and writing high quality books. Everything was now, finally, ready for mass development of the RADIO. It can be said that from 1922-3, radio moved out of the hands of the pioneers, and into our everyday lives. Radio has become a permanent feature of our environment. With the advent of radio, came the communication era, the information era, even the dis-information era. In 1924, the American Presidential Election campaign was broadcast across the country for the first time. The wireless was without doubt, a success factor for Republican candidate John COOLIDGE who became, thanks to the power of this new media, the 30th President of the United States. Radio became, within a few decades, a commodity coveted by all powers, but particluarly by political powers (remember the use of radio by the 3rd Reich for the broadcast of NAZI propaganda). The problem did not escape the thinking of the early pioneers. Marconi himself, in the magazine LA MOVADO (ESPERANTO magazine) September 1926 issue, noted that "the largest superiority that man has over the animals, is his ability to communicate in detail, his thoughts to his fellow creatures." It is no real surprise that the pioneers of radio, such as Doctor Pierre CORRET (shown opposite) were interested on the one hand in the development of a common language of communication on a global scale, and contributed to the spread of the international language, ESPERANTO, and on the other hand, worked on the popularisation of Radio, a medium for communicating that language. During the 1920s, Dr Corret was vice-president of the Society of Friends of Radio and member of the International Esperantist Academy. He was also one of the first French amateur radio enthusiasts (call sign 8AE). The image, taken in 1925, shows him sending a New Year greeting to his friends around the world. It was perhaps no accident that the first International Congress on ESPERANTO, presided over by its inventor, Dr Louis Lazard ZAMENHOF, took place in 1905 at Boulogne-sur-mer near to Wimereux where MARCONI had installed a wireless station some years before. The journey's ended, but the story continues. "science sans conscience n'est que ruine de l'âme"(Francois Rabelais). which can be translated as "Science without responsibility leads to the destruction of the soul"
The author hopes that you have found this journey through time interesting and that you will come back soon to follow the next steps in this fascinating story of human achievement.